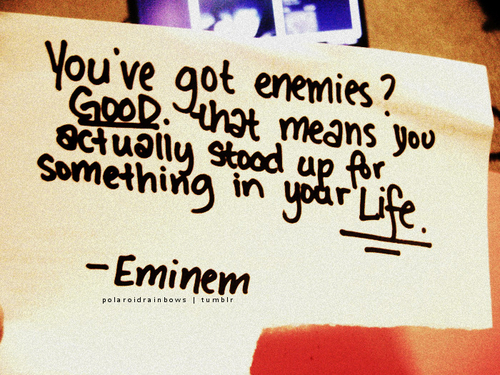 ...: words of wisdom from Eminem...? words of wisdom from Eminem...? I don't believe that you should keep your enemies closer then your friends, that logic just doesn't make sense to me. Why not keep people around you who make you happy, who make you smile, and who you are not worried about impressing? I feel those friends are the ones who will help you enjoy your life instead of simply flowing through it. It's all about vibes, cut the bad ones out.